The unprecedented earthquake in Haiti and the massive destruction it caused reminds me of the significant destruction that resulted after the Aceh tsunami five years ago. The Haiti earthquake hit the country’s capital, Port-au-Prince, which is the center of government and economic activities. The combination of enormous damage on facilities and infrastructure, the collapse of the national government function, and the lack of preparedness and experience make it inevitable that the people of Haiti will rely on the international community for guidance and coordination. This situation is different from what happened in Aceh after the 2004 tsunami. At that time, although the devastation was also severe and affected a large part of Aceh, it did not affect the country’s capital city. The Government of Indonesia, which is located in Jakarta, remained fully functional and was able to coordinate the emergency response, disaster assessment, and reconstruction effort that followed. The government was also able to set up reconstruction agency in only a matter of months after the disaster. Looking back to those years, it seems that the Indonesia Government has since built a lot of capacity and gained more confidence in handling disasters and conducting post-disaster assessments. After the tsunami, the government’s effort to conduct a damage and loss assessment was largely supported by international partners. The tsunami assessment was a marking point for the government in utilising an established methodology and more systematic approach to assess damage and losses, as developed by the UN’s Economic Commission for Latin America and the Caribbean (ECLAC). When another major disaster happened in Jogyakarta in 2006 (pdf), the Government proved to be more proficient in conducting the assessment and still continues to develop the country’s capacity in disaster management, a skill which is very much needed in a country such as Indonesia that is prone to disasters. Disaster management laws were issued in 2007 and a national disaster management agency (BNPB) was set up in 2008 as a guardian of disaster risk management in Indonesia. 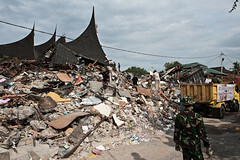 BNPB’s role in responding to disasters was strongly demonstrated in the West Sumatra earthquake in 2009. As the appointed national agency for disaster management, it provided the overall coordination and worked very closely with provincial and local governments. The capacity of the BNPB to lead the assessment and their knowledge on the assessment method was evident. Clear guidance was provided to the team on the field situation, response plans, and on the expectations of government. Smaller group meetings based on different sectors were set up to have focused discussions on data and situation analysis. The local governments also made a huge contribution by providing and compiling data in a short time period from the various areas across the affected province. Strong knowledge, commitment, enthusiasm, and hard work are obviously exposed in the process. Being involved in the previous disaster has made me realize how well the capacity of the government has evolved during the last five years. It is evident that the Government of Indonesia has learned important lessons from past disasters in how to better respond when disasters strike, and it is continuously evolving – perhaps not yet to a maximal point, but has already reached higher ground. It also seems that the fruit of extensive efforts are now ripening. Photo courtesy John Orford under a Creative Commons license. Thanks Wolfgang, supporting the WS DALA has indeed been another great experience for me. I might not be able to provide comparison on monitoring the reconstruction progress of Sumatera as I am not quite involved in it, but perhaps I can share something later on monitoring the money based of course on our experience in Aceh as a comparison for Haiti. But I guess, we'll see first how the Haiti come out with the plan of tracking the aid.